DIY craft projects for home that even the most creatively challenged can make. Discover how to make cool simple crafts with easily accessible supplies here. 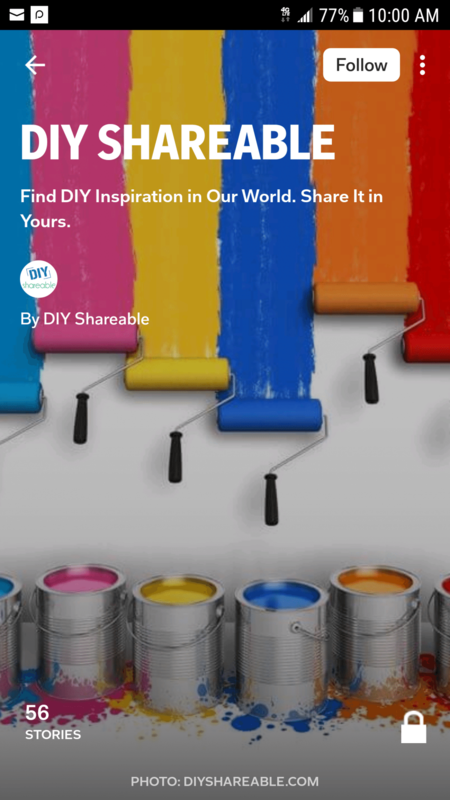 DIY craft projects are everywhere; they’re outlined in books, on TV, and the Internet. Some of those DIY crafts may look pretty intense and downright intimidating. Here are 21 “do-it-yourself” crafts that any adult can do with easily accessible supplies, no special knowledge or experience needed. Most can be accomplished in an afternoon, although some require extended drying times which may push the project into a second day. Cork letters are easy to make but take a few hours to do, due to the number of corks involved. First, get yourself a wooden letter, which can be found in any craft store. This tutorial uses a 22 inch letter which required over 300 corks. Smaller letters obviously require less. Then start gluing! Put down glue just a few corks at a time so it doesn’t dry before you get everything in place. The final result will have a rough appearance to it, as corks do not have a single standard size. You may be able to see the edge of the wood letter in places as well, and that’s perfectly fine. You’re not going to perfectly cover a straight edge with a collection of round objects. Want more projects like this? Check out our post on clever wine cork crafts. Glass etchings are beautifully sophisticated. They’re also easy crafts to do at home. You’ll need something made out of actual glass, not clear plastic. This tutorial uses a glass water bottle, but you can just as easily use this on other glass projects. Engraved wine glasses could make an elegant gift, for example. Find a silkscreen stencil pattern you like and firmly secure it to the glass. Then apply etching cream, being careful not to get the cream anywhere other than within the stencil. The cream will eat into the glass, so your stencil pattern will be cut into your object. Wash off everything well, and make sure you don’t get any cream on your skin. Sharpie markers and alcohol don’t play well with one another, and that fact will let you make some very cool designs! First, apply any number of Sharpie colors to a blank ceramic tile. Then, drip rubbing alcohol over it, allowing the alcohol to dissolve and push around the ink. Leave it for a good half hour to thoroughly dry, and you have great organically shaped, unique designs for every tile. Add a coat of varnish, and these make great coasters. If you’re looking for simple crafts, this is about as simple as it gets. See the steps here. If you like the sparkle of gold in your home decor, consider these glittered candle holders. Painter’s tape is used on clear votive holders to protect the bottom half of the glass. Rolled up paper keeps the inside of the glass clean as well. Then, spray glue is liberally applied, and glitter is sprinkled over it. Insert a votive, and the glitter will lend a little extra sparkle to the candle flame. Create an affordable wall hanging from a bathmat, paint, and a bit of yarn. You’ll want to find a plain bathmat to act as your canvas to start. Then, lay out your design in tape and apply paint. Glue knotted and unraveled bits of yarn to one end to create fringe. Finally, press the other end between two strips of wood which are then secured to the wall. Adding gold to an already existing item is a hot DIY trend right now. Here’s an easy way of brightening up a setting with a splash of gold. This tutorial starts with white vases, but you could also spray paint an item white or use a colored item. Using painter’s tape and Saran wrap, cover the areas you don’t want to be painted gold. Then, apply gold spray paint to the exposed surfaces and allow to thoroughly dry before removing the tape. There’s really no limit to how you can apply this project. Play around with different colors and objects. Also, consider the shape of the painted area. Shall it be a vertical stripe? A horizontal one? A diagonal? Something more complex? It’s all up to you. Create a colorful bowl with Mod Podge and confetti. A balloon is used as a framework over which the bowl is formed. Mod Podge is painted onto the balloon’s surface, then confetti is liberally sprinkled over it. The process is repeated several times to build up enough material to make a stable shell. After allowing it to dry overnight, the balloon is popped and peeled away, leaving a shell of confetti and glue. The edge can be left uneven or carefully trimmed. See it here. Unless we’re lucky enough to have a free outlet near a table, our cell phoneend up on the floor while they’re charging. The situation leaves open every possibility of our phones getting kicked or stepped on. In addition, it’s just unsightly. However, you can construct a protective, attractive holder for your phone when it’s charging. It’s built out of an old plastic bottle, such as one for shampoo or lotion. If it has a paper label, it should be removed. The ideal bottle will actually have its label printed directly on the plastic. After it’s cut into the correct shape, it’s time to decorate so it no longer looks like a plastic bottle. You may want to sand down any print so it doesn’t show through your decorations, although a couple good coats of paint or heavy decorative paper should also do the trick. As far as DIY crafts for home are concerned, it doesn’t get more utilitarian than this. You’ll use this one every day. Remember those big magnetic plastic letters from when we were children? They’re still around! This project gives them a bit of class. First, spray paint them a uniform color. This tutorial assumes white, but you could use any color you like. Then dip the letters part way into a can of paint, giving them a two-tone look. Then spell out cute messages on your refrigerator or other metallic surface. If you’re looking for a more permanent display, glue them to a backing surface. You could create anything from a handmade welcome sign to a properly labeled cookie jar. Here are some cool craft tealight candle holders made out of air drying clay. First, press a tealight into a lump of clay to create an impression, which will hold the light once the project is finished. Then, cut the clay at a variety of angles, giving it an asymmetrical, geometric shape. Finally, leave out to dry. You can paint them if you want to or just display them raw. Find the step-by-step here. Give a room a vintage flair with light up marquee lights! Purchase a couple cardboard letters from a craft store, and cut off one side of each with an X-acto blade. Then cut a series of circles into the letters just large enough to hold the light bulbs of a set of string lights. Spray paint the letters for a more finished appearance. A metallic paint can really help with the illusion that these are old theater marquee lights. Insert the light bulbs, connect them to their cord, and just plug in. This tutorial provides a template for making little house-shaped plant pots out of oven-baked clay. Just roll out the clay, cut it according to the template, assemble, and bake. Painting your project is optional. The result will be water-tight, allowing a small plant to thrive within it. Personalize a fabric item with someone’s name, or let it reflect a fun or inspiring quote. This works on everything from aprons to accent pillows. You’ll want to lay your fabric flat. That means if you’re working on something like a pillow, you’re going to want to remove the cover from the pillow itself. If you can’t, it’s going to be very difficult to keep your letters in any way lined up. Stencil all the letters in pencil first. That way, you can erase and correct any mistakes. Then stencil again with fabric marker. That’s it, you’re done! Check it out here. Candles are all rage right now, and so are their holders. This tutorial specifically illustrates votive candle holders, but you can easily apply it to any clear candle container. Forget about expensive paints. 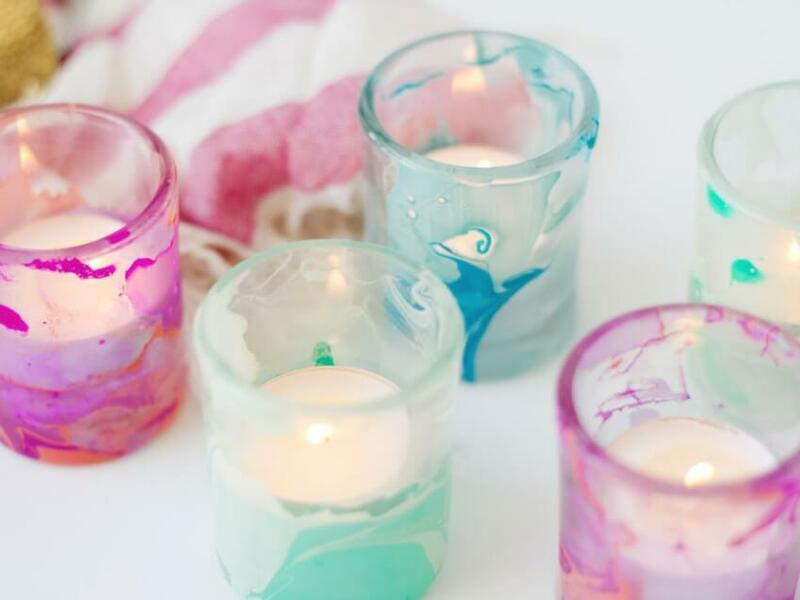 You can create a permanent marbled effect by dripping nail polish into water and then dipping and rolling the candle holder in it. Let it dry an hour and spray it with sealant, and you have a colorful addition to your décor. Add a pop of color to formal events by partially dying your cotton napkins with a color of your choice. The gradient is created by soaking one end of the napkin is dye, then working it upward with a sponge brush. As the dye slowly runs out, the color gets lighter and lighter. The use of a sponge brush creates a somewhat striped effect. Impress your dinner guests with your new found DIY talent! See more here. Here’s a classy way of dressing up your refrigerator, presuming your refrigerator attracts magnets. All you need are clear glass beads, magnets, and cardboard letters. Using clear glue, affix a cardboard letter to the flat side of a bead, with the letter facing the bead. The letter will be easily readable through the bead. Then, glue the bead and cardboard to the magnet. The tutorial writer found her letters in the scrapbooking section of her local craft store. You could also print out a custom set from your computer, although trimming so many bits of paper would obviously lengthen the project. If you’re an adult, these can be used to spell out cute, profound or absurd statements to brighten someone’s day. If you have children, this can be educational. It might be best to steer clear with the little tikes though since the beads are small enough to be swallowed! There’s also nothing saying you have to use letters. If other symbols, patterns or images attract you, they can just as easily be used in this fun little project. Bring a slice of nature or Fall into your home with natural branch coasters. The only difficulty to this project is getting the raw materials. You’ll need a branch that’s at least 3.5” wide. Your best bet may be to contact a tree trimming service and ask if you can access their scraps one day. Cut your branch into 1/2 inch slices. Try not to disturb the outer bark as that is what really gives your coasters a natural feel. Stain the wood, then varnish it, and you have durable coasters that are great conversation pieces as well. Get more details here. Ever have trouble finding bookends that will actually hold up your books? You won’t have trouble here as you make a pair of bookends out of wood or concrete blocks! You can use just about anything as decoration, just as long as you can glue them to the blocks. Ideally, you’ll want to buy them in pairs so you can have a matching set. After gluing the pieces to the base blocks, hit them with a couple coats of spray paint. Then add felt pads to the bottom so you don’t scratch your bookshelf. If you’re tired of double-checking to see if dishes in the dishwasher are clean or dirty (or you keep putting dirty dishes in with clean ones! ), this project is for you. Spelling out “Clean” on one side and “Dirty” on the other, this magnet can be oriented according to the current state of the dishwasher. The words are spelled out with Scrabble letters. If you don’t have a Scrabble game you’re willing to sacrifice, you can buy collections of Scrabble tiles online. The tiles are attached to a felt backing, which is then attached to a magnet. Before you start this project, double-check that your machine is attractive to magnets. Believe it or not, not all of them are! Here’s a way to create tile coasters bearing any design you can print out on your computer. Apply Mod Podge to your tile, then also to your design, and press the two together. The Mod Podge adheres to the front of the paper while allowing you to tear off the back after the adhesive has dried. It might take a few tries to get a hang of removing the excess paper, but the supplies are cheap: the tutorial writer purchased a box of 10 tiles for $4. Building jewelry out of metallic hardware is becoming increasingly popular. Here you find directions to create three different bracelet designs using washers, hex nuts, and leather cord. Big Tip: Be sure to make your cord about 3 inches longer than the length that you desire to allow for any knots that are part of the design. Don’t forget to buy enough materials at your local hardware store to make a matching necklace if you like. So, there’s 21 cool craft ideas just about any adult can do, almost all of which can be completed in an afternoon. So now that you know how to make crafts, what’s stopping you? Try a project or two and release that untapped creativity within you, and don’t forget to come back and share your results!